A standard weight range isn't just one size fits all; you have to factor your age into the equation as well. For a good idea of where in your peer group your weight falls, you can consult age and weight charts, which provide generalized weight averages related to age. However, it's important to note that they don't necessarily help people determine ideal weight, because they don't figure in factors such as height or frame. A tool to help determine the right body weight is the BMI (Body Mass Index). This is also determined from a standard calculation. Use the following BMI calculator for simplicity and convenience. Select between US customary and metric units of measure. Enter your weight in pounds (US customary) or kilograms (metric). Enter your height in feet and inches (US customary) or meters and centimeters (metric). The widget will then display your BMI. To perform a new calculation, click the "Clear Results" button. Determining your basal metabolic rate is also useful. Choose either US customary or metric units at the top of the widget. Click on your typical activity level, from sedentary to extremely active. The widget will then display your BMR and the average number of calories you need to consume each day to maintain your current weight. Click the "Clear Results" button to start a new calculation. The widget below can calculate your ideal body weight quickly and easily. Choose between US customary and metric units of measurement. Select between male and female. Enter your height in feet and inches (US customary) or in meters and centimeters (metric). The widget will compute your ideal body weight using both the Miller formula and the World Health Organization guidelines. Click "Clear Results" to perform a new calculation. 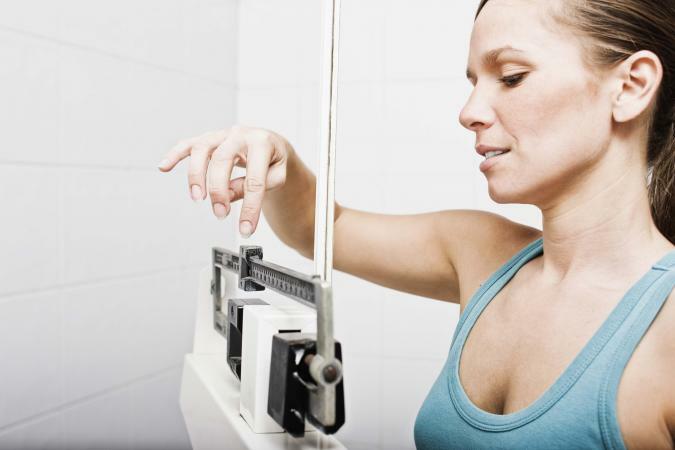 It's natural that you gain weight when you age, particularly between your 20s and your 30s. As you approach 40 and 50, you need fewer calories, but you may continue to eat as you did in younger years, resulting in weight gain. This need for fewer calories is due to physiological changes that take place in the aging process. Nerves send impulses about 15 percent slower between the ages of 30 and 60 to 70, resulting in slower movement and reduced power output. Maximum lung capacity peaks around age 30, and decreases about 20 percent by 70 years of age. Cardiovascular ability decreases about 10 percent per decade for women after age 25. In general, cardiovascular ability decreases about three percent per decade in your 20s, six percent per decade in your 30s, and continues increasing to over 20 percent per decade in your 70s. There is usually a 35-40 percent decrease in muscle mass for both men and women between 20 and 80 years of age, even if weight stays the same. These changes result in weight gain as a part of aging if your calorie intake and activity level remain the same as when you were in your 20s. It's important to eat healthy and exercise regularly if you hope to prevent mid-life weight gain. In fact, increasing your activity level is one of the best ways to thwart middle-age spread. It is important to consider that your body composition will change as you age, so there is no need to compare yourself to the 25 year old intern at the office. That doesn't mean you have to settle, either; there are steps you can take to help offset these changes - eat healthy, work on building your strength and maintaining muscle, and see your doctor if you feel that you may need help balancing your hormones.